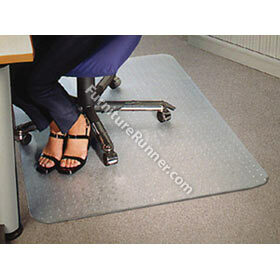 The safer, extremely durable, and more environmental alternative to traditional PVC general office and chair mats. No cracking, no curling, no yellowing, no smelling. Clear and very durable - due to its hardwearing capabilities, this high quality plastic is used in the aircraft industry and in the manufacturing of bullet-proof glass. High clarity and impact resistance - virtually unbreakable. Environmentally safe - PVC-free, odourless and completely free of any toxic chemicals. Easy to clean - simply wash with soap and water. Fire resistant - in accordance with 4102/B1 (resistant to burning cigarettes), polycarbonate fulfils fire related insurance regulations. Very ergonomic - minimal gliding resistance for chairs with casters. Compatible with floor heating systems. Negligible gas emissions make our mats ideal for people who suffer from allergies. Safety health features make polycarbonate a recommended material for use in the vicinity of children.